This lion modelled by W. F. Woodington and made in Coades artificial stone stood from 1837 on the parapet above the river front of the Lion Brewery Lambeth. It survived the surrounding devastation in the war of 1939 - 45. And when the site was cleared for the building of the Royal Festival Hall was preserved in accordance with the wishes of His Majesty King George VI. We've left the punctuation unchanged in our transcription of the plaque: missing apostrophe and full stop before 'and'. Often the layout of the text on a plaque performs punctuation duty and when we transcribe we replace the formatting with the necessary punctuation. But on this one there is no formatting and precious little punctuation. OK for a quick note but surely one should be extra careful when composing the text for a plaque? We found PMSA to be the best source of information about this much-loved lion. He was one of a trio of lions, not carved, but cast in Coade stone from originals by Woodington. This, the largest, was originally painted red and stood on the river-front parapet of the Red Lion Brewery. Given its size and weight (13 ton) it’s probably relevant that the Coade factory was very close to the brewery; the two buildings being either side of, and about equidistant from, the Hungerford Bridge railway tracks. To discover exactly where the two smaller lions were sited see the photo-based A London Inheritance. George VI must have had a soft spot for these big cats since when the building was demolished to make way for the Royal Festival Hall, the King requested that the lions (well, two of them) be rescued and the large one was re-sited at the York Road entrance to Waterloo Station. From Goods and not so Goods we learn that a lion was very appropriate for a British Rail station at this time since the first lion-based BR logo was introduced in about 1950: the ‘lion on a unicycle’. This sand-coloured lion did not last long. In 1956 that logo was replaced with the ‘ferret and dart-board’ image which featured a red lion. The colour is interesting since at some point the red-painted brewery lion was scrubbed clean to become the naked South Bank lion that we see today. Assuming the Coade lion was intended to echo the logo lion we guess he was stripped clean when first installed at the station. 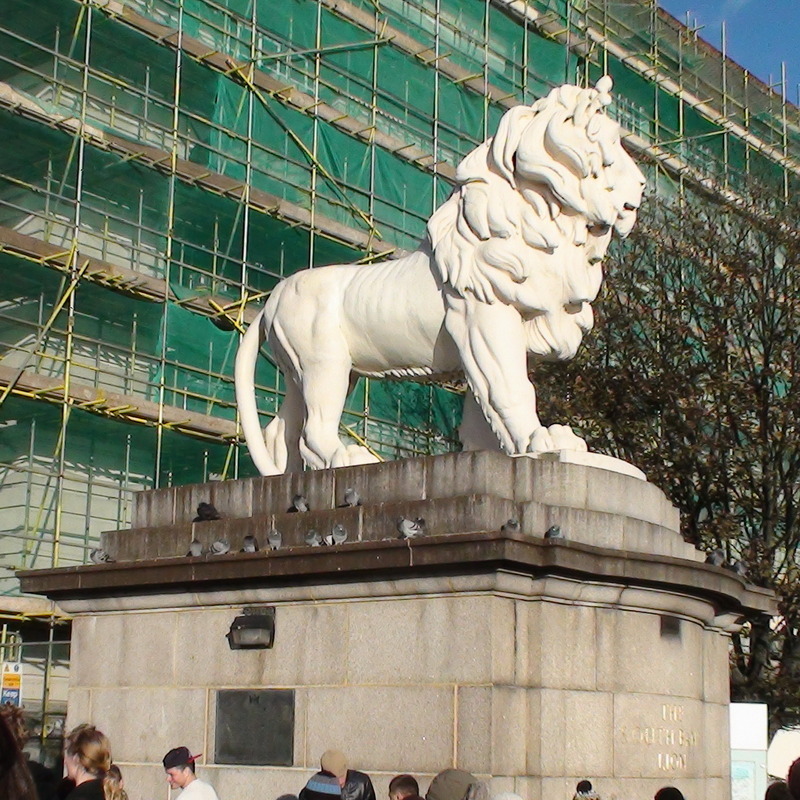 Alternatively the logo was changed so that, colourwise, its lion matched the Coade lion, in which case the colour was probably not removed until installation on the South Bank. On removal from the brewery a recess in the lion’s back was found to contain: a bottle holding two William IV coins and a Coade trade card. When Waterloo Station was remodelled in 1966 the GLC moved the lion to its present site and replaced the bottle, along with a 1966 coin, a copy of the GLC Chairman's letter published in The Times, 17 March 1966, which gave a brief history of the lion, and a copy of an article on Coade stone by J. H. Holroyd, published in The Times, 5 March 1966. The other rescued lion (which used to be at the entrance to the brewery buildings on the south side of Belvedere Road) was given by the GLC to the Rugby Football Union on its centenary and it is now, painted gold, at the Lion Gate to Twickenham Stadium. The PMSA do get one thing wrong – we are told by our rugby consultant that the British Lions have nothing to do with Twickenham Stadium. They are more properly called the British and Irish Lions and, being a touring team, they have no home ground; they don’t even play in the UK. So the lion statue at Twickenham is not their “mascot”. The team that is associated with Twickenham is the England Rugby Union team and their symbol is a rose. The royal arms of England do sport a lion so perhaps that is the connection. We first noticed this lion way back in the 70s. Out for a walk along the river-front we noticed big cat footprints stencilled on the ground. These led us to the apparent culprit, high on his plinth. It was never proven but student involvement was suspected. The walkway plaque is the one you can see on this giant plinth, to the lion's right. Born at Sutton Coldfield. Died at home at Brixton Hill. See the plaque at this site for more details.